You knew Wyoming wind was strong, but at Big Hollow it created the second largest deflation basin in the world. Come see a National Natural Landmark and experience wind so strong that there are whitecaps in the outhouses. West aerial view of the Big Hollow area. River terraces are numbered oldest to youngest (1 to 6). Location of pipeline trench cross section AA’ is shown. Zephyrus was the god of the west wind in Greek mythology. He was considered the gentlest of the four cardinal wind gods and the harbinger of Spring. The zephyrs that streamed from the Quaternary (1.8 million to 10 thousand years ago) ice cap on the Medicine Bow Mountains were not gentle. They aggressively eroded the frozen, arid landscape of the southern Laramie Basin. Wyoming experienced episodic stages of glaciation throughout the Pleistocene. The Holocene “Little Ice Age” ended only about 150 years ago. The warm gentle Springtime breezes were a long way in the future. The Big Hollow is an erosional scar left by the Pleistocene west wind in the southern Laramie Basin south of the Wyoming wind corridor. The depression is elongated for 11 miles easterly, 4 miles wide, and 150 to 200 feet maximum depth. Covering an area of 40 square mile, it is the largest deflation basin in North America and the second largest in the world. Generalized sketch of the Wyoming wind corridor. Location of the Big Hollow shown by yellow star. Abbreviations: Southern Laramie Basin (SLB) Lander (LND), Casper (CPR), Douglas (DGW), Rawlins (RWL), Laramie (LAR), Cheyenne (CYS), Walcott Junction (WJ), Saratoga (SA), Medicine Bow (MB), Wheatland Reservoir CWR), Wheatland (WH) and Chugwater (CG). Image: After Marwitz J.D., Dawson P.J. (1986) Low Level Airflow in Southern Wyoming during Wintertime by Aircraft. In: Xu Y. (eds) Proceedings of International Symposium on the Qinghai-Xizang Plateau and Mountain Meteorology. American Meteorological Society, Boston, MA, Fig. 1, p.478. East view of the Big Hollow from Eagle Rocks. Note the gravel surface capping Eagle Rocks. These calcium carbonate cemented metaquartzite cobbles were deposited by Pleistocene streams from the Medicine Bow Mountains onto Cretaceous bedrock and protected this surface from erosion by the wind. Abundant clasts exhibit the windblown abrasion rock surfaces known as ventifacts. The northern segment of Airport Bench on the left of the image is similarly armored and marks the boundary of the deflation basin. ​The southern Laramie Basin lies above 7,000-foot elevation between the Medicine Bow Mountains (west) and the Laramie Range (east). These structures were created by Laramide compressional tectonism that began in the late Cretaceous (70 Ma). The basin was filled with sediment that lapped over the mountains throughout most of the Tertiary (65-5 Ma). The Gangplank on the southeast of the Laramie Range is a relict from this period (see https://www.geowyo.com/north-platte-river-one-dammed-thing-after-another.html). The Rocky Mountains experienced regional uplift in the Pliocene (5-1.8 Ma) that removed a vast amount of Tertiary fill from the basins. Climate change during the Pleistocene generated glaciers in the mountains and periglacial tundra in the basins. Outwash streams shed clasts from the mountains during periods of glacial retreat Terraces developed as streams cut into the basin floor as base level changed. Clasts were deposited along the paleostreams bed generally less than fifty feet in thickness. Six former floodplain surfaces are recognized in the Big Hollow area. The strong winds eroded Cretaceous bedrock that did not have the protection of a gravel cap over the last 250,000 years. Playas aligned with the dominant wind direction developed on these internally drained basins. Big Hollow area geologic map. Trend of Big Hollow anticline shown by red line. Oil field shown by green polygon. Explanation for Cenozoic geology and map symbols displayed on bottom (see original source for older units). Image: Left: After Sutherland, W.M., and Hausel, W.D., 2004, Preliminary geologic map of the Saratoga 30' x 60' quadrangle, Carbon and Albany counties, Wyoming: Wyoming State Geological Survey Open File Report 04-10, scale 1:100,000, http://www.wsgs.wyo.gov/products/wsgs-2004-ofr-10.pdf; Right: After Ver Ploeg, A.J., and Boyd, C.S., 2007, Geologic map of the Laramie 30' x 60' quadrangle, Albany and Laramie counties, Wyoming: Wyoming State Geological Survey Map Series 77, scale 1:100,000, http://www.wsgs.wyo.gov/products/wsgs-2007-ms-77.pdf. Laramie Basin structural cross section. Structural features were developed during the Laramide Orogeny. Deflation is the geologic process of erosion by wind. Wind can move sediment in three ways: creep (slide across surface), saltation (skip and bounce along surface), and suspension (wind-borne). Wind borne sediments also abrade other clasts in a manner like sandblasting. The presence of ventifacts on the surface of high standing (older) benches indicate wind erosion. Blowouts, playas (temporary shallow bodies of water accumulated in the center of hollows), and downwind fine sediment plumes are further evidence of eolian processes. Abundant ice-wedge casts and sand-wedge relics found in the terraces and basin floor establish the periglacial climate of the basin during the Pleistocene. Modes of eolian sediment transport. River terraces carved in the southern Laramie Basin. Terrace location shown on aerial image above. Approximate ages of formation shown in parentheses in millions of years ago (Ma). Levels are numbered oldest to youngest with feet above the Laramie floodplain (F.P.) noted: 1) Table Mountain (2.3-2.1, 2 Ma) Eagle Rocks (1.75-1.45 Ma), 3a) North Airport Bench (1.2 Ma), 3b) South Airport Bench (1.2 Ma), 4) Harmony Bench (0.75-0.65 Ma), 5) Pahlow strath and terrace (0.3-0.275 Ma), 6) Stock Farm terrace (0.025 Ma). Image: After Rehis, M.C., Palmquist, R.C., Agard, S.S., Jaworoski, C., Mears, B., Jr., Madole, R.F., Nelson, A.Rr, and Osborn, G.D., 1991, Quaternary history of some southern and central Rocky Mountain basins, Chapter 14, in Morrison, R.E., Editor, Quaternary Nonglacial Geology: Conterminous U.S., Geological Society of America, The Geology of North America Volume K-2, Fig. 10, p. 423, https://www.nrc.gov/docs/ML0037/ML003756793.pdf. Cross section AA’ along the Trailblazer Pipeline trench. Location shown on aerial image and geologic map. Lithology and periglacial wedges are displayed. Note gravel armor on river terraces. The Big Hollow is eroded into the Upper Cretaceous bedrock of the Steele Shale (80-83 Ma) and the Niobrara Formation (83-89 Ma). The former consists of a soft black shale deposited within the Cretaceous Interior Seaway. It is about 2,300 feet thick in the Laramie Basin. The contact with the underlying Niobrara Formation is gradational and is marked by a color change to a weathered yellowish-orange calcareous shale. The Niobrara Formation consists of 800-900 feet of calcareous shale and carbonate mudstone with thin chalk beds. Both formations are non-resistant and were scoured by Pleistocene winds. The Big Hollow was listed on the National Natural Landmark registry in 1980 as a classic example of “topographic reversal”. The Big Hollow area was a positive feature as streams flowed in the low ground around it, depositing outwash gravels on their stream beds. Strong winds eventually eroded the positive feature and Cretaceous bedrock into the basin seen today. The southern Laramie Basin contains numerous other eolian and periglacial features. Sequence of events characterizing topographic reversal: A) development of gravel armored floodplain, B) topographic reversal from wind erosion and lowering of floodplain (base level), C) late Pleistocene development of periglacial polygons filled with silty sand. Eolian and periglacial features in the southern Laramie Basin. Image: Google Earth; Data: Marrs, R.W. and Gaylord, D.R., 1982, Techniques for interpretation of windflow characteristics from eolian landforms: Geological Society of America Special Paper 192, Plate 2, p. 47; Mears, B., Jr., 1987, Late Pleistocene Periglacial Wedge Sites in Wyoming: an illustrated compendium: Wyoming State Geological Survey Memoir 3, Fig.1, p. 2. The Big Hollow oil field was discovered in 1900. The Muddy Sandstone produced 22 API gravity oil from a 20-foot zone at about 850 foot depth. 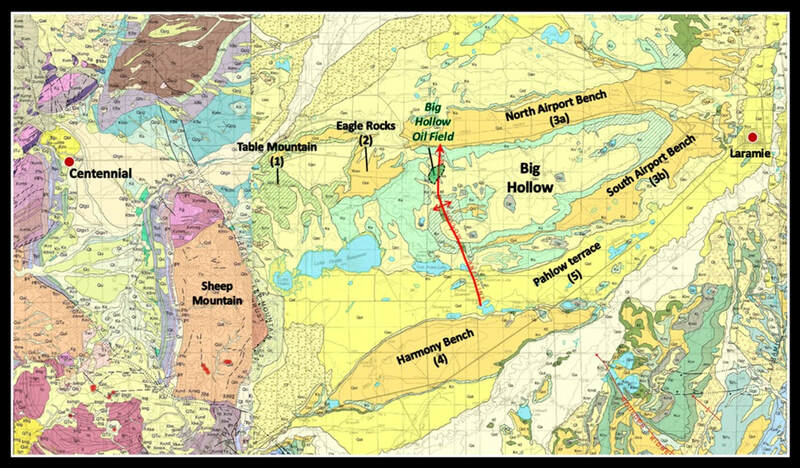 The field produced about 30,000 barrels of oil from a Muddy Formation sand body that draped over the Big Hollow anticlinal nose (see Big Hollow area geologic map for field location). 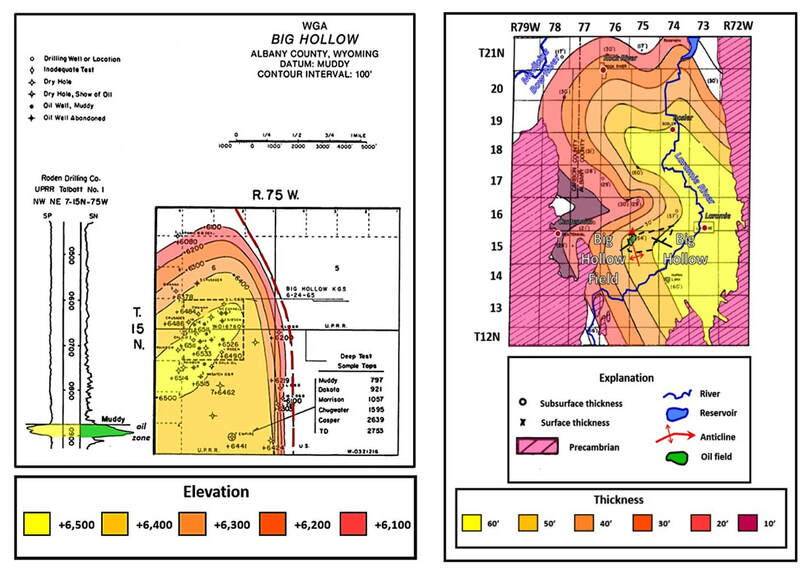 Big Hollow oil field structure (left) and regional Muddy formation thickness (right) maps. Image: Left: After Uresk, J. and Gibson, J.W., 1984, Big Hollow: Wyoming Geological Association SE Wyoming Oil and Gas Field Symposium, Laramie, Hanna and D-J Basins, p. 20; Right: After Oster, L.D., 1953, Stratigraphy of the Cloverly Formation, the Thermopolis Shale, and the Muddy Sandstone in Part of Southeastern Wyoming: Wyoming Geological Association Laramie Basin, Wyoming and North Park, Colorado, 8thAnnual Field Conference, Plate III, p. 45. The Laramie Basin permafrost disappeared about 12,000 years ago and only a few stagnant glaciers remain from the Medicine Bow ice cap. The wind, however, has maintained a constant presence. Wyoming is the windiest state in the country with an annual average wind speed of 12.9 mph (NOAA, 2017). Winter winds frequently reach 30 to 40 miles per hour, with 50 to 60 mph gusts. Zephyrus still dwells in Wyoming. “Daily it is forced home on the mind of the geologist that nothing, not even the wind that blows, is so unstable as the level of the crust of this Earth.” (Charles Darwin, 1839, The Voyage of the Beagle).